Edwin Albert Tostevin was born in Racine, Wisconsin on September 22, 1864. He graduated from high school and had two years of business college education which was unusual for the times. Edwin worked first as a farm machinery salesman for his father’s fanning mill plant. In that capacity he had an early opportunity to visit Dakota Territory and see first-hand the life of a pioneer farmer. When area farms fell on hard times, he accepted employment with the Racine Journal Publishing Company in 1887 at the age of 22 and worked his way up the ranks and eventually into the business office of the newspaper and peaking at the post of corporate Secretary. But Edwin Sr. realized if he was ever to be manager/editor, he would have to find his own newspaper. In 1909, he traveled to North Dakota and purchased the Mandan Pioneer, a weekly newspaper, from W. Harry Spears. (The Pioneer Publishing Company was incorporated in 1883, with the Marquis de Mores, Michael Lang, Joseph Miller, R.M. Tuttle, A.C. Macrorie and George Bingenheimer as stockholders). In the first issue of the Pioneer under EA's management, he offered the following introduction: "In assuming control of the Pioneer, the writer wishes to assure the people of Mandan and the people of Morton County that the policy of the paper will not be changed, that it will be found loyal to those Republican doctrines and principles under which the nation has prospered. To issue a bright, clean, newsy paper one that will deserve the loyal support of the people of this section, will be the ambition of the writer." The paper continued as a weekly until April of 1914 when it became a daily paper. Lively, local political campaigns for state and county offices and the outbreak of WWI ensured the necessity for a daily paper and the circulation almost doubled in a short time. The Mandan Daily Pioneer was an influential paper serving the Western Slope area. He had married Florence Gertrude Clemmons in Racine on May 31, 1888. The couple had three sons, Earl Herbert, Walter Clemmons, and Edwin Dodge. All three sons would join their father in the newspaper business. While Earle and Walter served their country in the Army, their youngest brother Edwin Dodge was assigned an even greater role at the paper. EA was a firm believer of the potential of this area of the state. He was very active in local civic affairs, including the Mandan Rotary Club as well as politics and worked to make Mandan a better place to live and conduct business. Edwin loved music, started playing the pipe organ as a child and was performing regularly by age 17 at his church. From 1912 to 1936, he was the regular organist at Mandan's First Presbyterian Church. Florence Tostevin died in 1937. Edwin married Miss Elma Spenser in 1938 in Racine. Elma Spenser died in 1950. 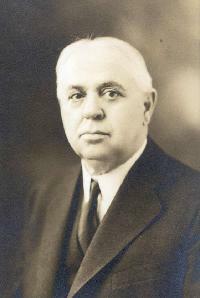 Edwin A. Tostevin died on February 15, 1943. He and his wife Florence are buried in Union Cemetery in Mandan, ND. The Tostevin family would remain in the newspaper business until they sold the Mandan Pioneer in 1963. The Society would like to thank members James and Patricia Tostevin for sharing this information with us.